This 1.5W retro-fit Integral LED G9 delivers a warm white light and brightness, similar to a 10W halogen bulb. 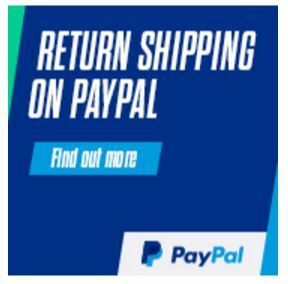 Ideal for living rooms, dining rooms and bedrooms, in classic or modern ceiling lamp fittings. This G9 LED Bulb Capsule lamp is a compact high intensity light source that is a direct replacement for existing halogen G9 capsule bulbs. This Integral G9 led bulb operates at 1.5 Watt and produces a bright 90 lumens of warm white light with a wide beam angle of 145 degrees which is protected by the frosted glass cover. These LED bulbs are a standard size and are a direct replacement for your existing Halogen G9 bulbs and are suitable for both domestic and commercial environments. 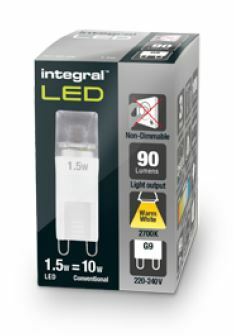 Integral the manufacturer offers a 3 year guarantee and a lifespan of up to 25,000 hours which is significantly higher than the standard 2000 hours of a typical halogen G9 capsule. Combined with the environmental benefits of no mercury content and lower running temperature this is a more advanced lighting option. . By making this investment you could have recovered the cost of your purchase within 6 months of installing your new G9 Led bulbs. G9 bulbs have a different fitting to screw in and bayonet bulbs and instead have looped metal prongs that are 9mm apart. These can come in a variety of sizes and wattages so can be used in various different situations. Typical uses include desk lamps, accent lights, and small appliances and also some lift manufactures specify the g9 for the lighting requirements. Unlike the halogen g9 the LED equivalent is extremely efficient and very long lasting, but also they will not get as hot due to the lower wattage. In most cases the G9 bulbs should easily come out the socket if pulled. Locate the bulb inside the recessed fixture to determine the removal method. Simply hold it with your fingers and pull it straight out. Be cautious not to twist the bulb, as this may cause damage to the bulb or even a cut finger. Insert the new bulb in the pin holes in the socket and push it in as far as it will go.